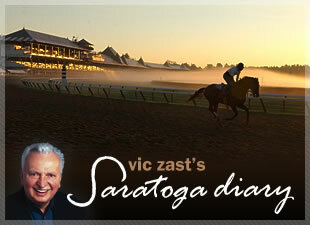 Three of Saratoga’s best five hot dogs are found on or near the racecourse grounds. The other two are only a short drive away – one to the west of the racecourse at the end of Nelson Avenue and the other in the opposite direction where East Avenue turns into Excelsior. PJ’s Barbecue, now called Bar-B-QSA, abandoned most things Buffalo, N.Y. in its conversion to a national franchise business. 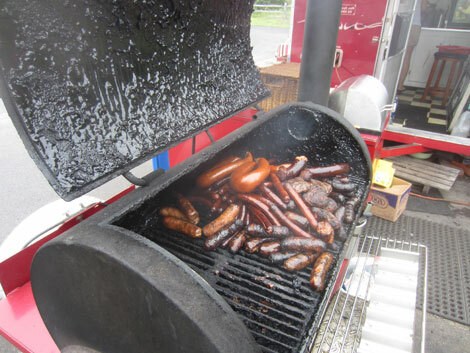 But the char-broiled hot dogs, made with premium pork and beef Sahlen’s wieners, are not among the casualties. Saratoga Awesome Dogs, established in a roach coach in a parking lot, uses Sabrett’s all-beef wieners and smokes them. The main selling-point for these is the meat sauce. A mountain of meat greets hungry patrons at Saratoga Awesome Dogs. At the racecourse, Christopher Lally of Rexford, NY swears by the boiled $2.00 Sabrett’s hot dog with sauerkraut that’s sold in the backyard. In the days before Shake Shack, many NYRA executives would stroll to the Trackside stand located just outside the Clubhouse gates during lunch hour for a sweet-tasting, all-beef dog that slides off a roller. But now that there’s Shake Shack, it’s tough for any hot dog to compete with the Shack-cago Dog. 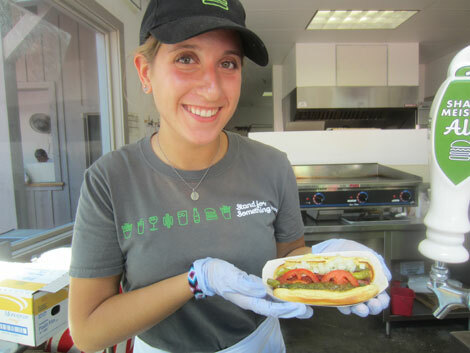 Liz Olson of Saratoga Springs, N.Y. presents Shake Shack's Fourstardog champion hot dog. While not technically a Chicago-style hot dog, a Shack-cago Dog is a treat that’s been “dragged through the garden” like the dog that inspired it. This all-beef frank has been grilled instead of steamed and does not rest in a poppyseed bun. Yet, it has the requisite pickle relish, dill spears, diced tomatoes, mustard, sport peppers and celery salt, and that’s all any Chicagoan would want. Wise Dan is a hot dog of a horse. Saturday, he took the $500,000 Fourstardave (gr. II) as if there was nothing to it. The course was yielding for the grassy mile and he had Get Stormy, previously four for six at the Spa, to beat. But Mort Fink’s son of Wiseman’s Ferry presented Hall of Fame rider John R. Velazquez with a convincing five-length triumph. Because NBC Sports couldn’t air the stakes at its usual time because of the Olympics, NYRA scheduled the Fourstardave at 6:45 p.m. It was a day of many disappointments, with bad fields, few close finishes and no turf racing but for the Fourstardave. Majestic Hussar won a maiden 2-year-old sprint that was supposed to unveil Archwarrior, a runner that was burning up the mornings for Todd Pletcher. But he scratched. Air Squadron, a late-running, long-striding colt by Curlin that finished a troubled fourth, is worth keeping an eye on. Ron Turcotte, a Hall of Fame jockey that rode Secretariat and Northern Dancer, was on hand to sign autographs and sell Secretariat memorabilia. “Big Red” won the Triple Crown nearly 40 years ago and his memory still draws a crowd. 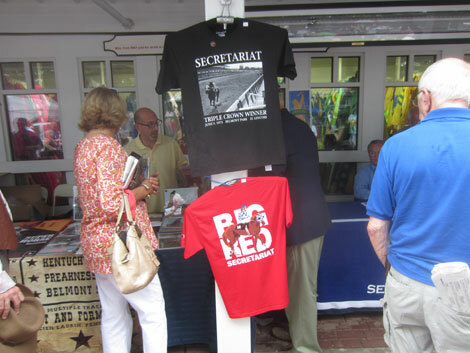 Secretariat memorabilia still popular after all the years. The National Museum of Dance held its Song and Dance Gala. Ben Vereen became an inductee of the Museum’s C.V. Whitney Hall of Fame. At SPAC, the Philadelphia Orchestra played the score to Wizard of Oz while the film played on screens overhead. Wizard of Oz was first screened in 1939.